Our non-surgical facelift treatment is a simple combination of Ultherapy, Botox ® or Xeomin ® with Dermal Fillers. 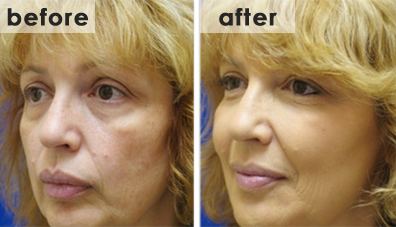 This combination treatment lifts sagging tissues and smooths out wrinkles. In non-surgical facelift, dermal fillers are injected where support and lifting effect is needed under wrinkles. This restores the lost volume, effectively “re-inflating” the face to the shape it lost with aging. In conjunction with fillers, BOTOX ® and Xeomin ® are also used in non-surgical facelift. BOTOX ® relaxes the wrinkle-causing muscles to help maintain the smoothing effect. Our latest revolutionary ultrasound treatment, Ultherapy, gives the tightening and toning of the face and neck area. It stimulates collagen production by going deep into the skin layers without harming the upper layers. 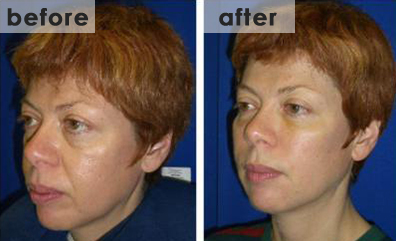 How can Non-Surgical Facelift help you with the signs of aging? Will the Non-Surgical Facelift hurt? The discomfort involved with injections of BOTOX ® and fillers is minimal, as these procedures are accomplished with use of very fine needles, similar in caliber to those used in acupuncture. Will I need to take time off to recover? These procedures do not usually result in much downtime, and are often called “lunch time procedures”. Book your consultation at Medical Spa Club, today!